It has been an amazing year and 2016 is coming to a close. 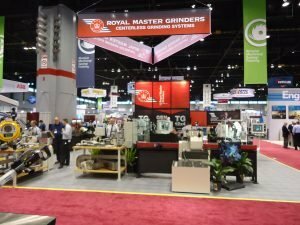 All of us at Royal Master Grinders want to thank you for your business and the opportunity to work with your companies each and every day. We understand and don’t take lightly the trust you put in our company, to grow yours. We have had some great things happen this year. We have had continued success with our TG-12×8 machine, and IMTS reaffirmed that it is a proven winner two years since its debut. With a number of orders for machines at IMTS, we were proud to also sell a few of these machines at the show for deliveries in the coming year. MDM in California and IMTS and were awesome shows with a large number of qualified attendees coming to our booth and working with our engineers on existing and new projects. For Rich, Bob and myself all the hard work we put into these shows, it is very gratifying to see the results of that work turn into viable projects for the coming years. One package includes full CNC dressing and enclosure for shipment abroad. This will be an amazing machine that we will bring you along for the ride with as it is being built. The granite has arrived and soon will be married to the base. This year as we do every year we introduced a new product. It was not a centerless grinder, but it was an App for your mobile device. AMO, or Advanced Machine Optimization in its very basic form is the production whiteboard at your fingertips. For use on IOS, Android, or Windows devices, you can log into your machine’s production data in the cloud and view its performance at any time. Different from MTconnect in many ways, this is a method of determining how to optimize your machine’s performance levels on your given application. For example, if your running three shifts and you are getting 30% less output overnight, Bu analyzing the app’s historical data in excel, it is quickly evident that the guy is taking long dinner breaks, or letting the machine sit idle for various reasons. Call us and ask for a test drive of this powerful tool.